Photoshop is so deep! Where do I begin? What are layers, channels and palettes? And can I print it out? Image manipulation can change the look and feel of a simple camera grab. Working with layers can open up your work on many levels. There are a number of ways we can trick our eyes and brains to see differently. Channel your energy! These visual effects are easy to create, but you must find a pair of the special glasses that 'unlock' the third dimension. This method of image manipulation harkens back to the time when photographs were black and white and photographers used oil paints to hand tint the images with color. The effect gives your new image an old time feel and look and teaches you a bit about color palette manipulation. Can ya print it out? You can prepare an image for printing and placement in a desktop publishing document or in some cases print directly from the image editing/preparation program. Setting up your camera for optimal face-flattering framing is worth the time and effort. Light and shadow along with camera angles can be a powerful tool in communicating with others. Adding a bit of your personality to email or a web page can introduce yourself favorably to a new friend. .
You've seen the little pulsing, blinking and never tiring buttons and spinning logos all over the web. They are the little sister of movies and they can spruce up a site and grab interest. Your cam software may be equipped to seamlessly attach a 'grab' and send it off instantaneously with an email, but if you have enhanced your image it may be sitting on your hard drive in a different file format. To manually send an image or file along with an email, you must attach it. Saving your still images and digital video movie files is easy! There is an array of choices in file formats, depending on the final destination and use you have planned. Here's a quick guide to some of the common ones and their specific uses. We battle with the limited bandwidth of the Internet everyday. Smaller is better and faster, so proper preparation of your file is essential. Know who and when you need these two allies for moving files and displaying them. Fashioning a web page has become a quick and easy way to distribute information to the world via the Internet and World Wide Web. Your ISP or a free home page site may offer storage space for your web pages so learn the basics and build from there. They will come! Once your first page is done, you may want tp create an entire website full of pages. With a little planning, developing a full site is a snap! 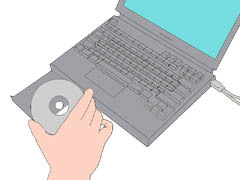 FTP, or File Transfer Protocol, is the way to transfer/move files from one computer to another. Most Internet service providers have tools built into their service that will allow you to 'upload' or 'download' a file. Stand alone software tools are also available for Windows (WS_FTP) and Macintosh (Fetch) computers. The process is usually a step-by-step progression. Using your cam with a microphone and video-conferencing software allows you to virtually meet with anyone anywhere. Tele-conferencing used to be an expensive and rare adventure reserved for high-level strategy meetings in James Bond films. Desktop digital cams have changed all that. Digital cams are designed to make your life easy and let you understand the concept of 'plug and play' It's as easy as 1-2-3.